Self-proclaimed “Rock ‘n’ Soul” ensemble PlanB Australia takes its bow with a debut album that delivers impressive results on both the rock and soul fronts. The band, a project driven by Peter “Sneaky Pete” Flierl, emerged from Del Webb Explosion - a short-lived affair that came and went during the early 1980s. The first incarnation of PlanB played around Adelaide for a few years in the middle of that decade, before folding. Flierl reformed the band in 2008 and has been working towards this album release ever since. Too Late the Hero opens with “Southern Delta”, a song featuring a strong brass riff that appears to intentionally set down a marker for the rest of the album. It’s a big soul sound, probably the biggest of the record. The horns weave their way in and out of songs throughout the remainder of the disc, but it is fitting that they are the first instruments heard. The prevailing theme of many of the songs is the double-edged sword of love and loss and generally the musical arrangement suits the lyrical sentiment. Songs like “Call Me” and “Give It Away” are impressive examples of this. There are, however, sufficient lyrical and musical diversions to keep the listener interested. The “Rock with Korshun” remix of the aforementioned “Call Me”, along with the strings and female vocals featured on “Images”, provide interesting and worthy diversions from the overall smooth, brassy sounds. As does the More Specials-esque lounge mood of “Maggies”. From time to time guest musicians augment the line up, the most notable being Dexys Midnight Runner “Big” Jim Paterson, lending his talents to the cover of the Dexys’ song, “Plan B”. This song would have made an excellent closing number. The bed tracks for most of the tracks on the album were recorded in Ho Chi Minh City in 2010-11 before being completed in Adelaide over the course of the last couple of years. Wayne Baker and Walter Kiess have achieved a polished sound that admirably serves the general mood of the album. This album leans more towards adult-oriented “rock” than it does to “soul” but, somewhat conversely, it is the soulful influences of the horns that make this album immediately identifiable. Too Late the Hero is chock-full of mature, laid-back rock, combined with a liberal dash of soul. 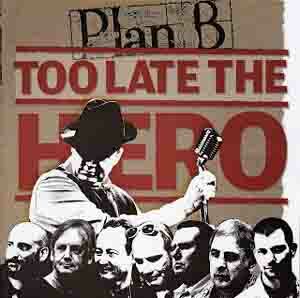 Too Late the Hero can be purchased from planbaustralia.com/ and will soon be available via digital download via iTunes and other online music stores.